Shield your Batmobile from the bad guys! This 1989 Batmobile Cocoon Replica is made of fiberglass. Limited edition Batman prop replica! Lined with felt to prevent damage to the surface of your vehicle. The perfect add-on for your Batmobile (TNGM1994, sold separately) is this Batman 1989 Batmobile Cocoon Replica from Toynami. 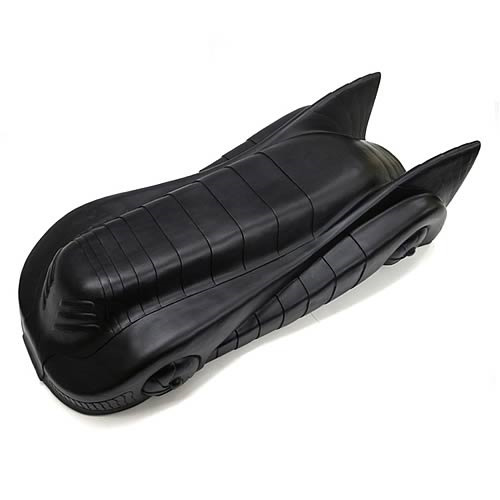 The Batmobile Cocoon is a fiberglass display cover that's made to completely encase the Batmobile, with an interior that's fully lined with felt to prevent any damage to the surface of your vehicle. It's a limited edition of only 500 pieces that measures about 6-inches tall x 12-inches wide x 29-inches long. Order your Batmobile Cocoon Replica now and shield your Batmobile from the bad guys! Ages 14 and up.